You looking for a unique way to take in the beauty of Hawke’s Bay or add a relaxing tour of the area while creating long lasting memories for you and your guests? Engaging the Hawke’s Bay Express will not only guarantee a once in a life time experience, it also ensures all hassle and stress is eliminated from your sightseeing and transport logistics. The Express is a custom built luxurious road train, appearing as a steam train on the outside and a 1930’s time warp inside. She has been fashioned after the gorgeous Orient Express, recreating the opulence and romantic atmosphere of the Art Deco era. Great attention has been given to detail and comfort. Get in touch with us to discuss your particular requirements and how we can contribute to making your successful event particularly memorable while show casing the regions beauty and breathtaking sights! 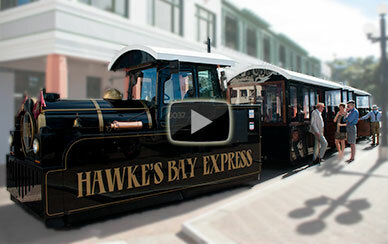 Select the image below to see how the Hawke's Bay Express can make your event a special occasion.